We offer a wide range of sizes and specifications suitable for a variety of applications. 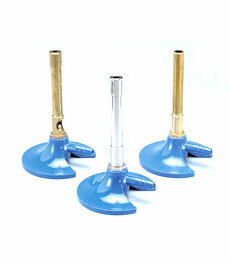 One of our major product ranges is our selection of labjacks. These are manufactured to very fine tolerances from aluminium and stainless steel. 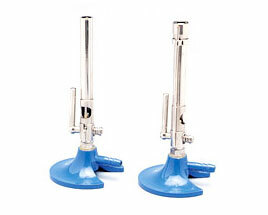 The burner range includes Bunsen Teclu, Meker and Micro burners together with a range of blowlamps. We produce a wide range of clamps in a variety of styles and finishes. All Rexaloy burners are constructed utilising a heavy pressure diecast base, painted in a chemically-resistant blue acrylic finish. We manufacture burners for a variety of gases so we will test at the standard gas pressure for each specific type of gas. Every burner is tested for flame quality and leakage prior to packing. Our LPG burners are designed to work at propane 35 millibars (14 inches water gauge) and butane (Calor) 28 millibars (11 inches water gauge). These gases generally achieve temperatures of 850 to 950’C, slightly lower than natural gas. The appropriate pressure reduction valve is fitted to the gas cylinders. As Liquid Petroleum Gases are much more searching than either coal or natural gas, all the jets on are LPG burners are securely sealed and if the jets are changed a jointing compound must be used to reseal as we cannot liability resulting from burners that have been stripped for whatever reason. Standard coal gas supply is 6.25 -millibars (4 inches water gauge) and coal gas produces the hottest flame, typically temperatures of 1000-1100’C can be obtained. As coal gas is operated at a lower pressure than other gases the jet sizes on coal gas burners are much larger that those for natural or LPG gases. It is important that no other gas is used in a coal gas burner as the flame will be very large and uncontrolled. We also manufacture standard burner for all types of gas in 11mm & 13mm. They are available in either nickel plated brass or plain brass. 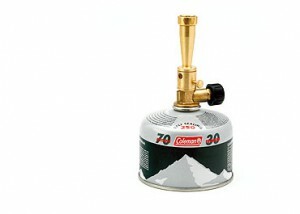 Cartridge burner Cartridge Burners are manufactured in brass with a replaceable plated steel perforated head. There burners are designed for use with propane / butane mix gas cartridges and can achieve temperatures in excess of 1000 ‘C. The gas cartridge has been designed to enable the burner to be detached and re-attached as often as needed making it easy to store & transport. When used with a 220gm cartridge, which has a typical burn time of 2.5 hours the burner fits a standard 8” tripod. Safety burners We can fit a flame failure device to our burners, which shuts off the gas supply within approximately 20 seconds of the flame being extinguished. 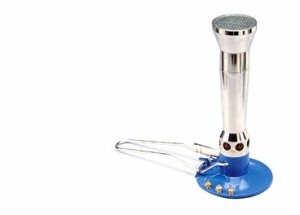 No electrical supply or battery is required as the safety features are contained within the burner. Whilst exhaustive tests have not yet caused a failure, the actuator and thermocouple are replaceable although in the event of damage we do recommend that repairs be carried out in our factory to ensure the burner is properly adjusted and operates safely. 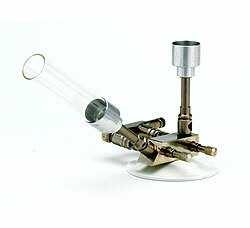 Many other types of burner are available including Micro, Meker and teclu burners.Please contact us for more details.